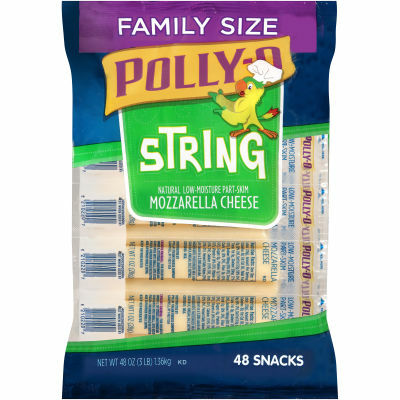 Polly-O Low-Moisture Part-Skim Mozzarella String Cheese - Polly-O Low-Moisture Part-Skim Mozzarella String Cheese is prepared with high quality ingredients that are healthy, delicious and free of artificial flavors and preservatives. Made from mozzarella cheese that has been seasoned with a pinch of salt, this string cheese has a flavorful taste the whole family will enjoy. Richness of Mozzarella - A good source of calcium and protein, Polly-O Low-Moisture Part-Skim Mozzarella String Cheese is a healthy choice, designed to satisfy your hunger between meals. Popular with adults and children alike, this string cheese is a perfect grab and go snack. Serving size 1 stick (28g).